Indonesian Batik was inscribed in 2009 on the Representative List of the Intangible Cultural Heritage of Humanity, maintained by the United Nations Educational, Scientific and Cultural Organisation (UNESCO). UNESCO is the United Nations specialized agency working within the fields of education, social and natural sciences, culture and communication to promote international cooperation in these fields in order to ensure a more peaceful world. The very act of creating batik has strong symbolic meaning for the Javanese. According to the Indonesian tradition, each time the batik artisan executes a particular intricate pattern, the design is not only fixed to the cloth, but the meaning of the design is engraved ever more deeply in the soul of the artisan. In the Kraton, or Javanese court, batik was one of the six priyayi, high arts studied by the cultured Javanese gentry. Batik, along with music and dance, was considered to be a way to develop spiritual discipline. In October 2009, the United Nations Educational, Scientific and Cultural Organization (UNESCO) added Indonesias batik to its global list of Intangible Cultural Heritage items. The essence of the batik process is to produce a design on textiles through the use of a dye-resist. The resist, usually wax (other materials such as rice paste are sometimes employed), prevents the dye from penetrating the covered areas of the fabric, thus creating a pattern in negative. Additional wax is added to embellish the design or preserve areas in the color of the initial dye bath. The cloth is then dipped in a second dye bath. This process is repeated a number of times, depending on the number of dyes involved. Producing a high quality piece of batik fabric is time-consuming and requires a high degree of skill. Batik workers sit on low stools with the cloth they are working on draped over a bamboo frame called gawanagan. 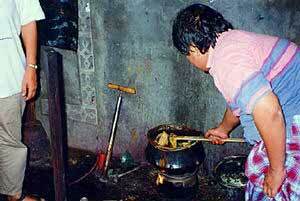 Next to them is a simple kerosene stove with a small iron wok (called wajan), which is filled with molten wax. The main elements of the design are usually penciled onto the fabric, but many of the details are added freehand. Very experienced artisans can wax designs, using a tool called a tjanting (pronounced "canting") directly to the cloth from memory. The tjanting is the most important tool of the Batik artisan. The tjanting is a small, thin-walled, spouted, copper vessel that resembles the bowl of a pipe. The implement is filled with molten wax and is held like a stylus. The batik artist draws designs on a length of cloth using the wax that flows from the tjanting's tiny, downward-curving spouts. The number of spouts, their widths and endings, can be varied to achieve different effects with great precision. For fine detailed work, a tjanting with a spout about one millimeter in diameter is used. A wider spout is used to fill in larger design areas. To begin work the batik waxer holds the tjanting in the hot wax for about a minute to heat it up. Then she fills it just so — not too little, not too much — takes it out of the wax, wipes the excess from the outside of the copper bowl on the side of the pan and blows on the tip of the spout to remove any excess wax there. Her movements must be very decisive and quick in applying the wax to the cloth. Any hesitation results in a blob of wax instead of the intended small dot or line. The wax cools quickly, so after a minute or so she must dip the tjanting in the wax and begin again. The process takes a great deal of patience and concentration. These are qualities highly valued by the Javanese. In order to achieve more than a vicarious understanding of the techniques of making batik, I traveled to Yogyakarta, Java, to study with a batik artist named Paksi. The young women who worked in Paksi's studio, enjoying their role as teachers, shared some of the tricks of the trade with me. Yantee showed me how to hold the cloth so that I would always be working horizontally from left to right, which is a more natural and therefore easier stroke to make. Satikum showed me how to remove my mistakes, if they were big ones (small mistakes can just be incorporated into the design). First she wet the area around the wax she wanted to remove. Then she took a knife that has been heated on the burner and alternately melted and scraped until the wax was removed. She also showed me how to clean out the spout of the tjanting with a broom straw when it became clogged with a little particle of dirt. After the main design has been outlined with either solid lines or small dots, detailed ornamentation, called isen is added. The criteria for what kind and how much isen to add is somewhat of a mystery. My batik instructor, Paksi, insisted that I add whatever ornamentation I liked to my design, but when I thought I had finished, he told me it needed much more ornament. Because tulis, or hand-drawn batik, takes such a long time to complete, much batik work today is done with a tjap (pronounced “chop”). A tjap is a stamp made with narrow strips of copper that are twisted and shaped into batik designs, then soldered to an open metal base. View a video of the batik process using a tjap, a copper batik stamp. Melted wax for stamping is kept in a flat-bottomed pan, called a layang, which contains a large folded cloth that absorbs the wax and acts like a stamp pad. The tjap worker dips the tjap into the hot wax, then applies it to the cloth, which is stretched out on a table that is padded to absorb the pressure of the stamp. Once the principal design and ornamentation have been drawn or stamped on the cloth all of the parts that are not to be colored in the dying must be covered with a thick coat of wax. When the outlining is completed, the remainder of the background is filled in with wax, using a paintbrush. The process is repeated on the back side of the cloth. The cloth is now ready to be dyed. Photo right, the dying room in the attic of Paksi’s studio, Jojakarta, Central Java. The cloth is stapled to a frame that rests on the four upright posts to apply the dye. Paksi is pouring an acid solution on the fabric to activate the indigo dye. Below on this page is a photo of the removal of the wax in a pot of boiling water. Traditionally batik dyes came from natural plant sources. The most widely used was indigo blue and soga, a warm brown color made from the bark of the soga tree. Complex recipes with esoteric substances — such as chicken's blood, banana pulp, and fermented cassavas (added to the dye bath to ward off evil) — were passed down through families. Dyeing was generally done by men. Rituals and taboos were observed to ensure a successful result. It was believed, for example, that if a man had an argument with his wife it would cause the dye to fail. 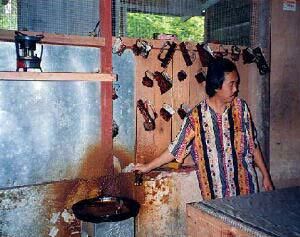 Today, chemical dyes are almost universally used for batik dying. When the cloth has dried, new areas that are to retain the color of the first dye color are waxed. In traditional Solo batik, the wax is scraped off from areas which are to be dyed brown. This results in the characteristic “fuzzy” color of Solonese batik. On the North Coast of Java, the first wax is boiled out and the waxing process starts over again. This results in designs with clearer definition. In some modern batik design, only part of the wax is removed from the background area, resulting in a mottled effect. The process is repeated until all the desired colors have been dyed. 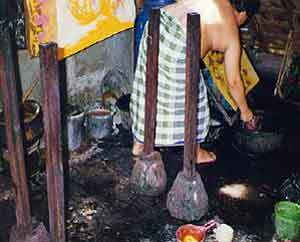 After the final dying, the cloth is boiled to remove the wax. There is always some remnant of wax remaining in the cloth, which gives batik its characteristic stiffness and lovely smell of beeswax.